Festivals and the French Revolution—the subject conjures up visions of goddesses of Liberty, strange celebrations of Reason, and the oddly pretentious cult of the Supreme Being. Every history of the period includes some mention of festivals, although most historians have been content either to ridicule them as ineffectual or to bemoan them as repugnant examples of a sterile, official culture. Mona Ozouf shows us that they were much more than bizarre marginalia to the revolutionary process. Festivals offer critical insights into the meaning of the French Revolution; they show a society in the process of creating itself anew. 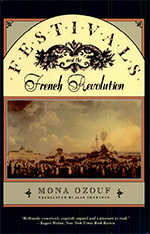 Historians have recognized the importance of the revolutionary festival as a symbol of the Revolution. But they have differed widely in their interpretations of what that symbol meant and have considered the festivals as diverse as the rival political groups that conceived and organized them. Against this older vision, Ozouf argues for the fundamental coherence and profound unity of the festival as both event and register of reference and attitude. By comparing the most ideologically opposed festivals (those of Reason and the Supreme Being, for instance), she shows that they clearly share a common aim, which finds expression in a mutual ceremonial and symbolic vocabulary. Through a brilliant discussion of the construction, ordering, and conduct of the festival Ozouf demonstrates how the continuity of the images, allegories, ceremonials, and explicit functions can be seen as the Revolution’s own commentary on itself. A second and important aim of this book is to show that this system of festivals, often seen as destructive, was an immensely creative force. The festival was the mirror in which the Revolution chose to see itself and the pedagogical tool by which it hoped to educate future generations, Far from being a failure, it embodied, socialized, and made sacred a new set of values based on the family, the nation, and mankind—the values of a modern, secular, liberal world.